Astronomical surveys of our Milky Way present a fundamental means to discover and understand the objects that populate our local neighbourhood in the Universe. Surveys of the Milky Way have been conducted at nearly all wavelengths of the electromagnetic spectrum, revealing the stars and the matter between them that form our Galaxy. At the highest photon energies that will be explored by CTA, our knowledge about the Milky Way is still incomplete, and to fill this gap, CTA will conduct a complete and deep survey of the Galactic Plane during its first decade of operations. The plan is to dedicate more than 1,600 hours of observing time to scrutinizing our Galaxy, which will provide an unprecedented legacy dataset that will form the basis for countless follow-up studies. The below image represents what CTA may observe during its Galactic Plane Survey. It is based on a simulation of the events that will be recorded by both CTA arrays, which, when combined, will provide an unprecedented view of our Milky Way. The simulation reflects our current knowledge about the population of very-high-energy sources in our Galaxy and comprises objects such as the remnants of supernova explosions, the nebulae created by young energetic pulsars and diffuse emission components arising from the interaction of energetic particles with the interstellar medium and radiation fields. In total, we expect to be able to detect about 500 individual sources of gamma-ray emission in the course of the survey. An important fraction of these sources will be spatially resolved by CTA, providing insights into the physics that accelerate particles to the highest energies and how these particles leave their accelerating sources. It also is expected that the survey will lead to the discovery of new and unexpected phenomena in our Galaxy, such as new source classes and new types of transient phenomena. 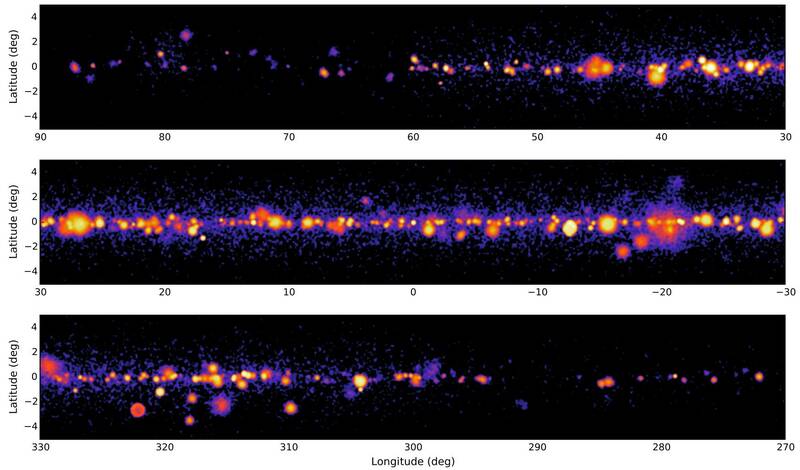 The detection of hundreds of new very-high-energy gamma-ray sources will substantially increase the galactic inventory and permit high statistics population studies for the first time. The survey also will be fundamental to unveiling sources that are capable of accelerating particles to PeV energies, which is key to understanding the origin of the cosmic rays that permeate our Milky Way. To learn more about CTA’s Galactic Plane Survey and other key targets, visit the Key Targets page or read our CTA Science Overview document (accessible in the Library when it is published in early 2017).